Inspired by the events of 2007 where a rather large stash of cocaine ended up washed up along the shores of Cork, ‘The Young Offenders’ (directed by Peter Foott) follows two best friends from inside the city as they try and salvage said cocaine to earn a load of money and move onto a better path in life. Conor (Alex Murphy), not known in the area for his intelligence, is initially reluctant to go for it as his Mum (Hilary Rose) has a dentist appointment on that day so he needs to cover for her at the fish market, but best friend and proficient bike thief Jock (Chris Walley) manages to rope him in. The two set off in the early hours of the morning on two stolen bikes to make their dreams come true, not realising that they’re being closely followed by obsessive cop Sergeant Healy (Dominic Hale). We know from the very start that it’s not going to work out for the two, so instead the story offers a unique array of experiences where the pair learn a fair bit about themselves. ‘The Young Offenders’ is primarily a comedy, with a brilliant mixture of slapstick, crudeness, and hilarious writing, yet it also looks at more serious issues – both boys have grown up in poverty and haven’t exactly had the best start in life. Jock lives with just his Dad, an alcoholic who hits him and steals his money, and this is dealt with in perfect balance with the comedic aspects of the film. This balance is what makes it so good – despite the frequent slapstick (which I guarantee will have you in fits of laughter) it’s got a real sense of realism without being overly gritty, meaning that it’s still funny and has a certain innocence about it. Jock and Conor are both idiots, which we work out pretty quickly, yet you can’t help but warm to them. The characters are all well-developed and each have their own strong identity. Yes, there are some clichés there, but the story uses these to its advantages. 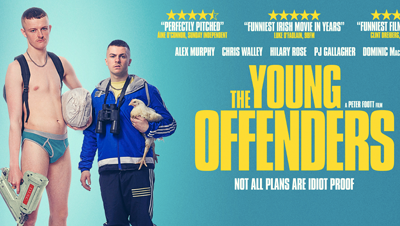 ‘The Young Offenders’ is also a surprisingly shiny and well-filmed watch despite being a low-budget project, with some very well done slow-motion shots that add to the humour of everything. The style of filmmaking is very modern – snappy and a bit surreal at points – and it gives us quite a light watch with a short running time (which I felt worked really well). There’s not a drawn-out or pointless scene in the movie, and the pacing means it’s hard not to get completely taken in by it all. Now, I’m not usually one for crudeness or focus on slapstick, but I’ll admit that this is one of the best low-budget films I’ve seen so far this year. It’s fantastically Irish and full of energy, yet it also makes a few important points that will last long after you’ve watched it.